Last October, St Brigidâs Carl Browne partnered Eoin Kennedy to win an outstanding 60x30 Doubles final. It was Browneâs first senior title while Kennedy over a senior playing career spanning almost 14 years has accumulated an astonishing 29 senior titles between singles and doubles and all three codes of handball, 60x30 softball and hardball and the 40x20 international code. After a winter break the St Brigidâs players are again on the march towards further titles judging by their recent performances. On Saturday last the pair showed that following their 60x30 victory they remain competitive in the so-called âsmallâ 40x20 court. After a tough campaign in Leinster where they overcame the Kilkenny pairing of Ciaran Neary and Brendan Burke in the Leinster final, they had a terrific victory last weekend in the 2016 All-Ireland semi-final overcoming Mayoâs Vinnie Moran and Joe McCann over three games. The match was played at the OâLoughlin venue in Kilkenny and the crowd were treated to a very competitive match. The Dublin pair started off very slowly and the Mayo players took full advantage leading from the beginning, gradually drawing further ahead to what seemed an impregnable lead of 21-5. The St Brigidâs players could have let the first game go but instead they fought for every point. By changing their serves and cutting out unforced errors they began a terrific come-back. As the Dublin players gained in confidence the Mayo pair started feeling the pressure and began to make mistakes. To the astonishment of the crowd the score was brought back to 18-20 with Dublin gaining 13 of those points in a single hand. The Mayo pair then had some luck as they put the Dublin pair out and Joe McCann delivered an unretrievable crotch serve to the bottom of the sidewall to give them a narrow 21-18 first game. It was clear however that the momentum of the match had changed very significantly. This was proved early in the second game as the Dublin pair gradually gained the upper hand and after a tense tussle in the middle of the game, they drew the match at one game all on a 21-13 scoreline. During the break before the third and decisive game the Dublin pair reminded each other that in the October 2015 final they also had to come back after a first game loss to win in the third. This turned out to be the case again as the Dublin players dominated the third with their superior fitness coming to the fore and with both executing perfect kill and passing shots. The final score of 21-5 in the third reflected the dominance of the Dublin pair. This fine result means that on Saturday 23rd April they will meet Cavanâs Paul Brady and Michael Finnegan in the All-Ireland final, again at the Kilkenny OâLoughlinâs venue. The Cavan pair must be clear favourites due to their outstanding record in recent years but based on last week we can expect the St Brigidâs players to give a good account of themselves. It is 10 years since Kennedy partnered Egin Jensen to defeat Brady and Finnegan in the final. It will be intriguing to see if Browne can partner Kennedy to success again in the 40x20 to follow their previous big-alley triumph of last October. 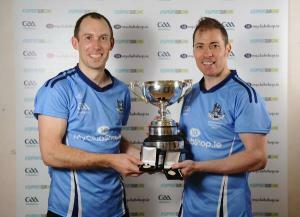 A riveting final is expected and tickets for the game will be on sale through the GAA Handball website.